Oh my, what a series! The titles in themselves are works of art. I obsessively read these as a teenager, and made sure my best friend was reading them too so she would get all my references. I'm pretty sure we went around talking in Georgia-speak, saying things like Ooo-er and Blimey O'Reilly's pants, laughing like loons, talking about luuurve, calling things marvy, adding -osity to the ends of words. I remember a whole sleepover where we dissected an fancying two boys situation using the cakeshop of love analogy. I still like to refer to myself "getting up at the crack of nine." And I'm fairly sure my cat is half Scottish wild cat too. Georgia was funny, and naive, so keen to get a boyfriend, and so loyal to her friends. They were silly together, which was great, with the pranks they pulled in school involving fake beards and viking horns. While the girls had made a snogging scale that went right up to number 10, "The Full Monty", throughout the books Georgia mostly did loads of snogging. I am well and truly on team Dave The Laugh. Robbie was cool but she could never be herself with him and same goes for Massimo. But Dave The Laugh was, well, a laugh. I looked down at Jas and said, 'Ooer.' Meaning he'd got to number ten on the snogging scale. And then we both laughed like loons. 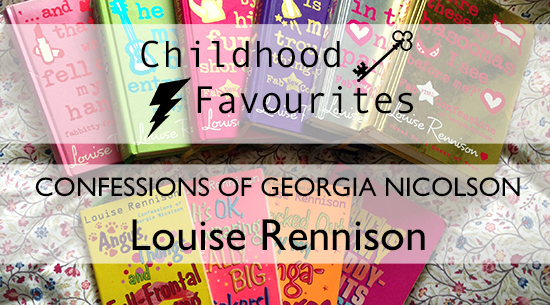 ― Louise Rennison, Are These My Basoomas I See Before Me? ― Louise Rennison, Stop in the Name of Pants!